This post introduces my new GenericServices framework designed to lighten the development load of building a service layer. This post summarises what GenericServices is about and the motivation behind it. It also provides links to code source and the example web site. I am pleased to announce the alpha release of my new Open Source project called GenericServices available on GitHub. It will also be available on NuGet when it is has a more stable interface (watch this space). GenericServices is a .NET class library which helps a developer build a service layer, i.e. a layer that acts as a facard/adapter between your business/data service layers and your User Interface or HTTP service. It does this by providing standard database CRUD (Create, Read, Update and Delete) methods and a standard way of calling business methods, each with clear extension points. The aim is to cut out the standard boiler-plate code so the user only has to write the data or business specific code. What application frameworks can GenericServices work with? GenericServices is designed work as a service layer framework in any .NET application, such as ASP.NET MVC, Widows Azure Web apps, etc. It assumed a disconnected state model, e.g. a web site or HTTP RESYful service where the read of data prior to update is disconnected from the update of the data. I have also assumed a horizontal scaling model, e.g. scale by having multiple web instances, as this is how Azure and most web sites scale. I have therefore not thought about serialisation of objects for vertical scaling, i.e. where each layer of the application are run on a separate server and remote calls are used between layers. GenericServices uses the following .NET frameworks/systems. 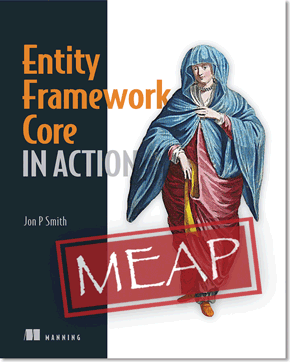 It uses Entity Framework 6 (EF6) for database access, again because it supports async commands. It also makes use of the open source AutoMapper library for transforming data and business classes to/from the user interface oriented DTOs. What is the motivation behind building GenericServices? I design and develop fairly complex analysing, modelling and data visualisation web applications (see Spatial Modeller). These require a Domain-Driven Design approach to the data and business objects, while the visualisation needs a comprehensive user interface which can include a Single Page Application (SPA) fed by a REST interface. This means there often a mismatch between the business/data layers classes and the data needed by the user interface and SPA. My experience is that the Service Layer, plus Data Transfer Objects (DTOs), is the best way to solve mismatch. However I have found that the service layer is often filled with lots of code that is very similar, with just the data being different. Its also pretty boring to write. I therefore researched a number of approaches to handle the standard code and finally came up with a solution using C#’s Generic classes. I have therefore called it GenericServices. Q: How would I use it? A: Look at example web site! I have taken the trouble to produce a live example web site. This has examples of all the GenericService commands, with documentation explaining how they work – for example see the Posts Controller code explanation page. As well as showing the use of GenericService it also contains another companion project of mine; code for executing long-running methods with progress and cancellation controls in ASP.NET MVC using SignalR. This web site is an ASP.NET MVC5 application and is itself an open source project called SampleMvcWebApp. The source of is available on GitHub. While in alpha phase I suggest you leave comments here of contact me via this web site’s Contact Page. Once it is up on NuGet I will try and set up a Stack Overflow group and monitor that.